The UVA Percussion Ensemble is directed by I-Jen Fang, the Principal Timpanist and Percussionist with the Charlottesville Symphony at the University of Virginia. 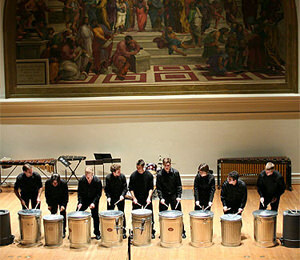 Re-established in spring 2005, the Percussion Ensemble is a chamber group that performs literature from classical transcriptions to contemporary music. The ensemble draws upon a large family of pitched and non-pitched percussion instruments. The number of players and the amount of equipment varies greatly from piece to piece. Music is chosen to match the abilities and interest of the ensemble members. Music reading skills and basic percussion technique on all percussion instruments is required. Previous percussion ensemble experience is highly recommended. The course is offered both semesters with a small group in the fall and a large group in the spring, culminating in an annual Night of Percussion Concert. Membership is open to all university students.